Back to 1891 Lighthouses. Forward to 1947 Lighthouses. When I came to write about the early lighthouse sets I was under the impression that they were two simple sets, issued in 1891 and 1905. But then a study of the Campbell Patterson Catalogue revealed they were far more complex than I ever imagined. There were the 1891 issue and another in 1913. Between these were two stamps that didn't seem to fit with either group. My stamp collection, which was started by my grandfather and continued by my father had these stamps arranged in two groups as most simple catalogues would show them. My father did a major re-arranging and re-mounting of the collection about 40 years ago. This is mostly how the older stamps are today, although I intend to redo them at some point. I still have the much older albums from my grandfather so I had a look in those. Of course, there were no stamps but you could see where he had laid out the stamps by date and his handwritten notes on each one. He had also placed the 1905 & 1906 stamps as a separate group. For the 1905 2d Chestnut there were locations for three examples in my grandfather's album while in my father's album there is only one. It was at this point that I made an amazing discovery. I have a copy of the 1905 2d Chestnut. Campbell Patterson values this stamp at $8,750 for unhinged mint and $5,000 for hinged mint. I found I had a hinged mint copy in my album. I went to the set of stock books where a large number of surplus stamps were kept and discovered that I had two more copies of this stamp, one mint and one used. Gently lifting the mint one out revealed it to be fine unhinged mint. Wow, that was amazing. So according to his notes, my grandfather considered the 1905 2d chestnut and the 1906 1d blue to be separate from the other groups for two reasons. First, they didn't fit into the 1891 group because they have no 'VR". 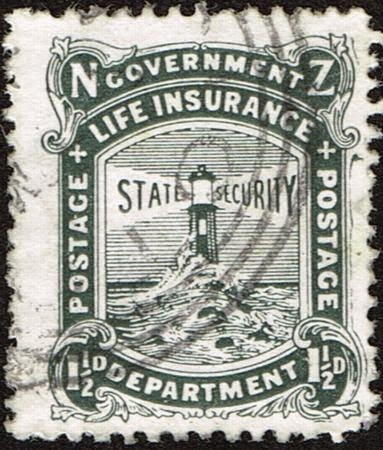 Secondly, they didn't fit into the 1913 group because they were issued and used before Government Life Insurance stopped using their own stamps for the period 1907 to 1913. (See below) That is how I have laid them out here. They were at the end of my first post and I have also included them here, at the beginning of this post, but I consider the 1905 - 1906 stamps to be a separate issue. 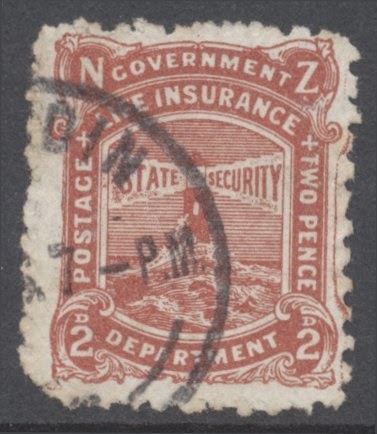 The printing plates of two of the lower values were becoming badly worn and needed replacing. In 1905 (2d) and 1906 (1d), new plates were produced in which the VR was omitted. Queen Victoria died in 1901 so the 'VR' was no longer considered relevant. At that point, the rays of the lighthouse were also widened. 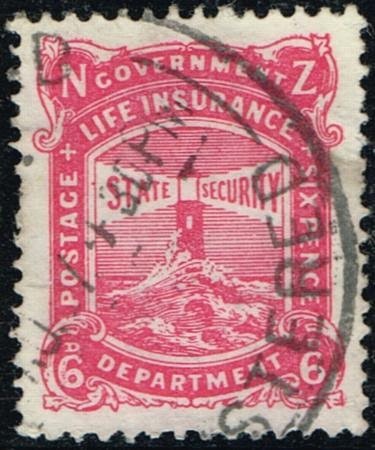 1905 Life Insurance (no VR). 2d Chestnut. Used. Mint copies of the 2d are rare and therefore very expensive. In 2015 Campbell Patterson valued this stamp at $8,750 for unhinged mint and $5,000 for hinged mint. 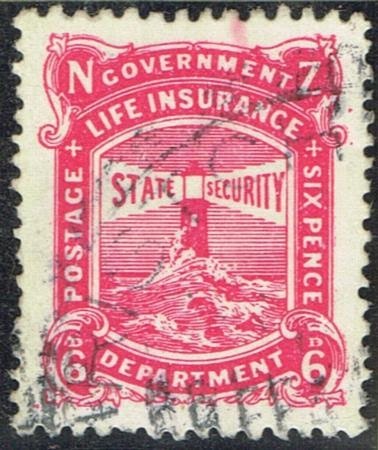 1906 Life Insurance (no VR). 1d blue. Mint and Used. 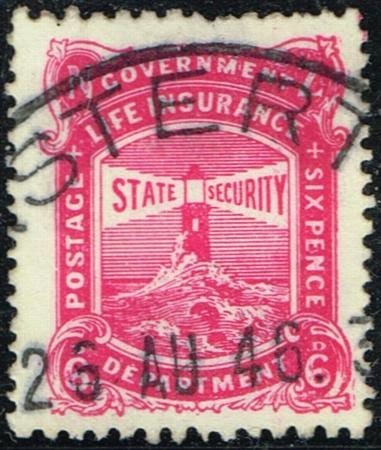 The following year (1906) another stamp was issued without the (VR). When 'Official' stamps were introduced in 1882 not all Government Departments used them. In 1907 all departments were directed to place 'Official' stamps on their business correspondence. 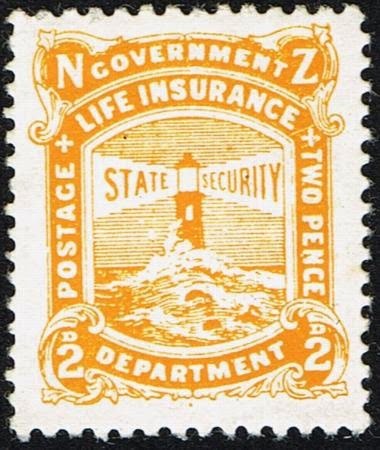 As for Government Life Insurance, the use the lighthouse stamps were withdrawn in January 1907 to be replaced with ordinary postage stamps overprinted with the word Official. The 1913 Issue. A new Lighthouse Set. 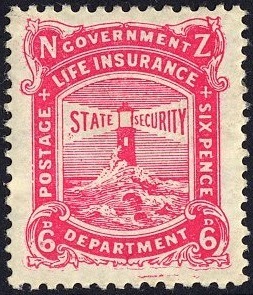 In 1913, permission was again given to the Life Insurance Department to re-issue its own stamps again. Five values, ½d, 1d, 2d, 3d, 6d were issued at first, with 1½d black being added four years later in 1917. I am unsure what caused this change in policy. The initial issue was on De La Rue paper and perf 14x15. 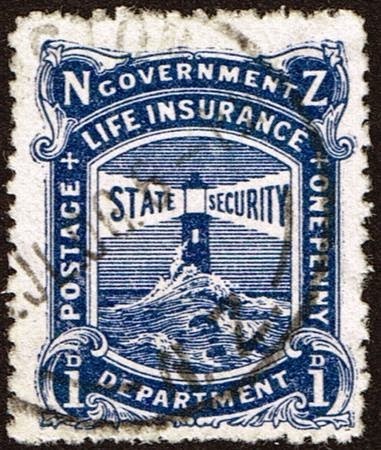 1913 Life Insurance (no VR). ½d Green. Mint and Used. 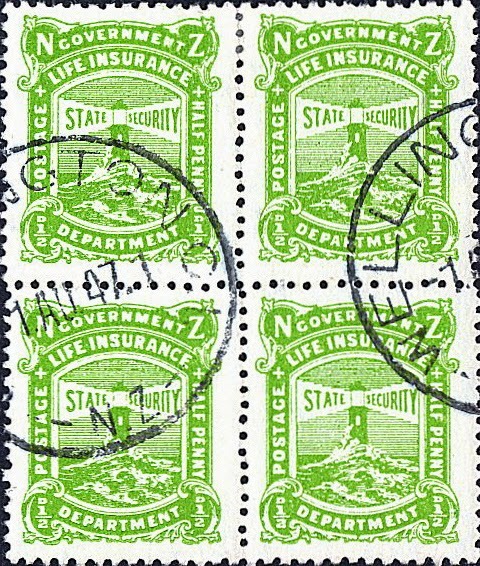 1913 Life Insurance (no VR). 1d red. Mint. 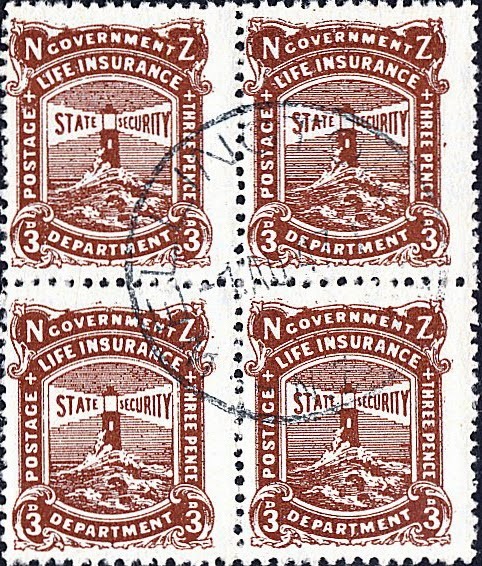 1913 Life Insurance (no VR). 2d Purple. Mint. 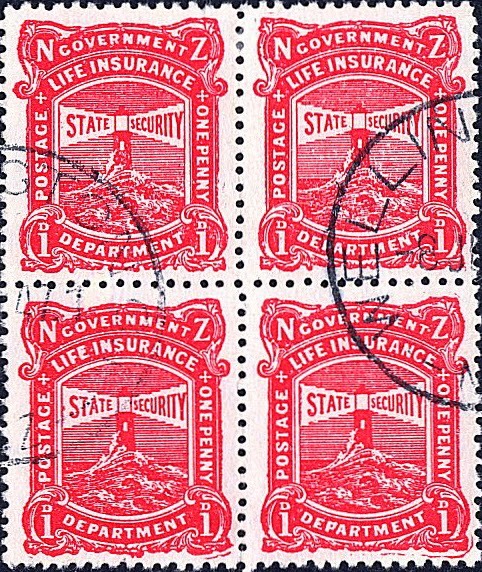 1913 Life Insurance (no VR). 3d yellow-brown. Mint and Used. 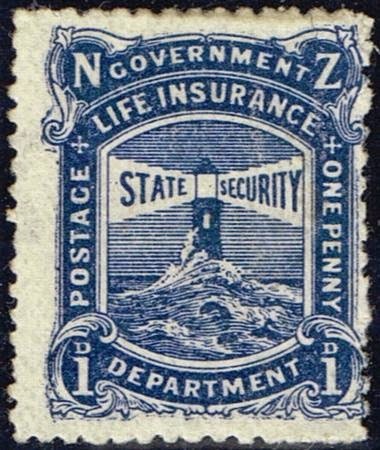 1913 Life Insurance (no VR). 6d Pink. Mint and Used. Middle Issues and Colour Changes. 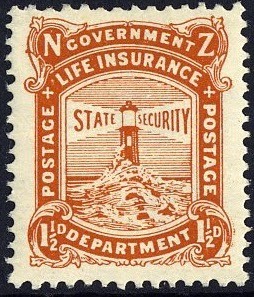 1917 Life Insurance. 1½d black. Mint and Used. 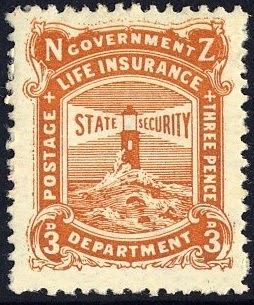 The 1½d value was not issued until 1917 and then two years later its colour was changed to orange-brown in 1919. Notice that this is the only value in the series that has the word "Postage" down both sides. All other values have the word "Postage" on the left side and the value in words on the right. Considering the short period that this stamp was used, I am surprised that 1917 1½d black has not increased in value more than it has. A fine mint copy is still only valued at $150.00. This is a great difference to the 1905 2d Chestnut seen above. 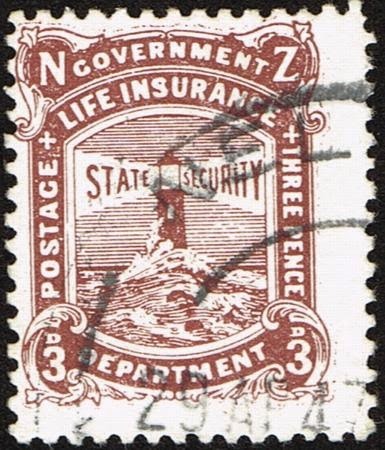 1919 Life Insurance (no VR). 1½d Brown-Red. Mint. 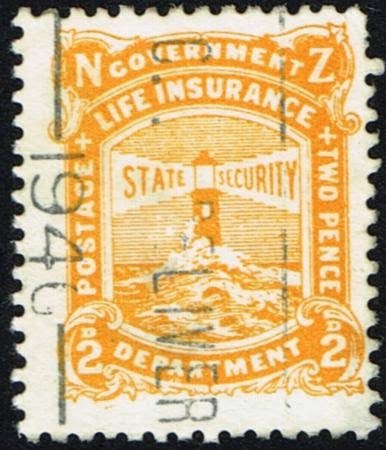 1920 Life Insurance (no VR). 2d yellow. Mint and Used. 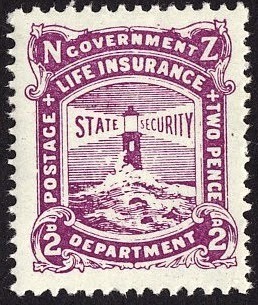 In 1920 the 2d purple was withdrawn and replaced with the 2d Yellow. Cowan paper perf 14x15 was introduced for the ½d and 1d in 1925, and perf 14 for the ½d in 1927, the 6d in 1929 and the 1d, 2d and 3d in 1931. 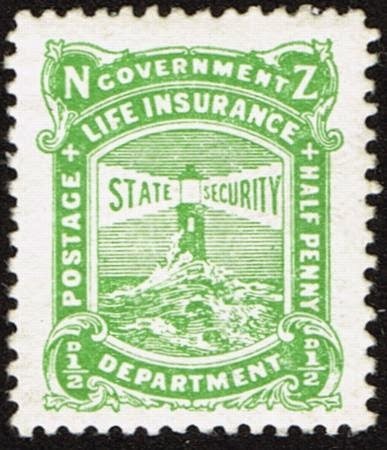 1931 Life Insurance (no VR). 3d chocolate used. In 1931 the 3d was changed from light-brown to chocolate. 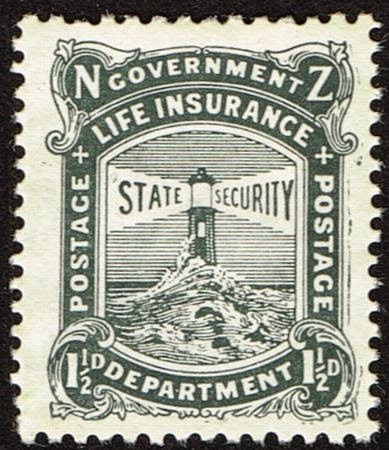 1937 Life Insurance (no VR). 6d Pink. Both used. 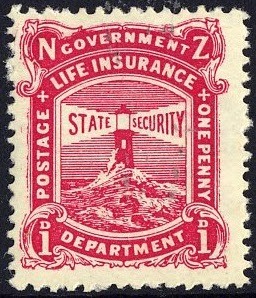 1944 Life Insurance (no VR) 1d-Scarlet. 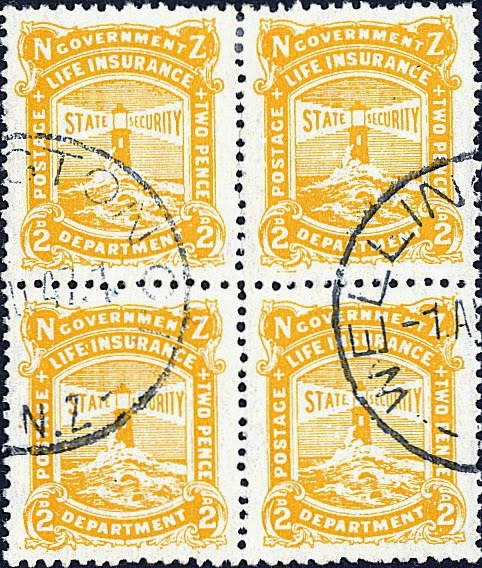 1946 Life Insurance (no VR) 2d Yellow. 1946 Life Insurance (no VR) 3d-Chocolate. 1947 Life Insurance (no VR). ½d Green. 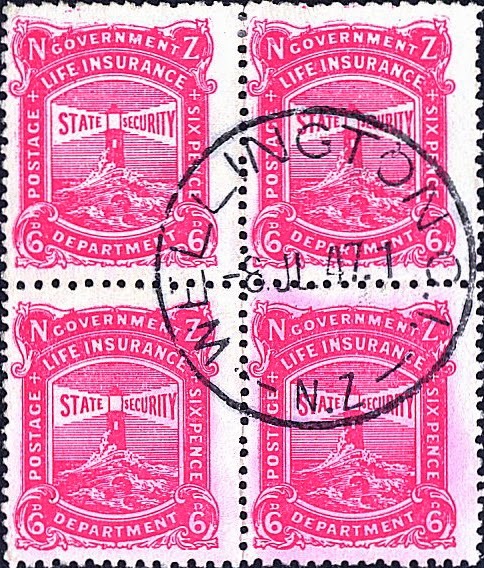 1947 Life Insurance (no VR) 6d-Pink. In 1947 all stamps in this early series were withdrawn to be replaced with the new Lighthouse series featuring views of actual lighthouses. Some NZ Government Life Insurance Covers. A Life Insurance cover with a 1d red with no VR. 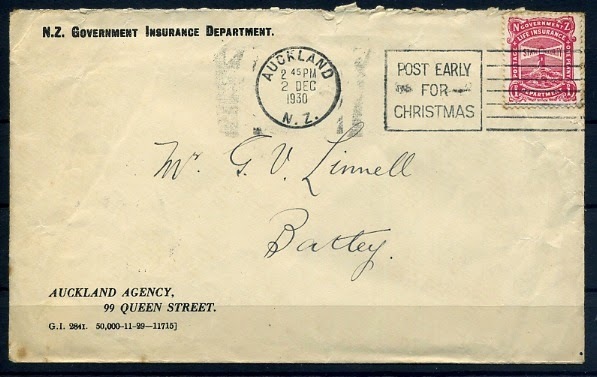 It was sent on 2nd Dec 1930 using an Auckland Agency illustrated cover. 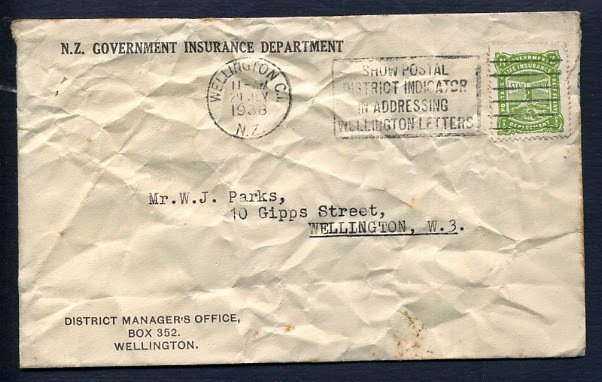 This Government Life cover posted in Wellington on 29th July 1938. Notice that it came from the Wellington District Managers Office. 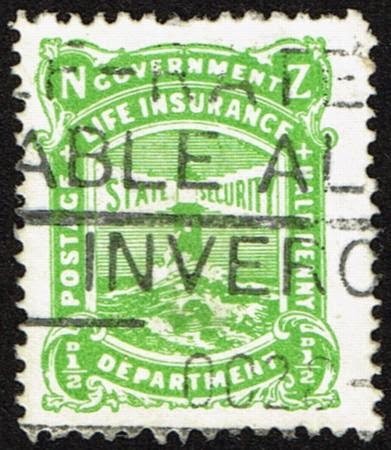 The stamp used is a ½d green with no VR. 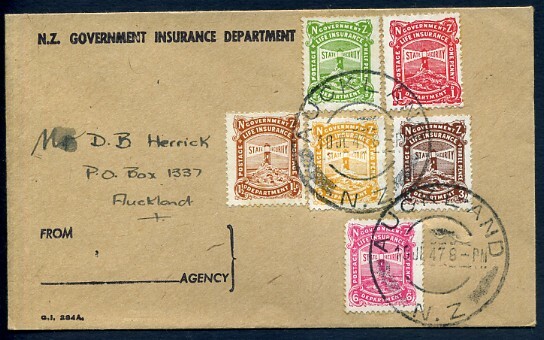 This cover comes from a lot later in the issue, 1945 only two years before these stamps were withdrawn. 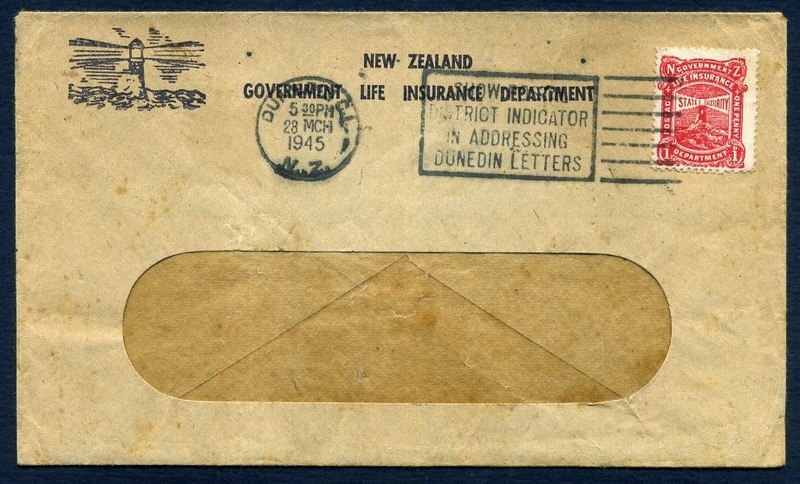 The cover is a Life Insurance Department printed window envelope used in Dunedin on 28th Mar 1945. The stamp is again, 1d red with no VR. 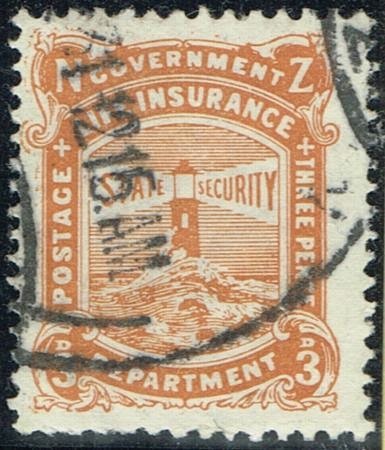 This was the very last month before these stamps were replaced with the 1947 Lighthouse issue. Wow that was a pleasant surprise Mary. That makes nearly $14,000 in only two stamps. How much is the used one worth? Next time I come up I'd like to see them. Yes it was Kirsten, A very pleasant surprise although the value is not that important as I have no intention of selling them. The used one is worth about $400.00. Still a respectable figure for a postage stamp. You are welcome to view them dear. Just let me know in advance so I can have them ready.